Demonstrators in Washington, D.C., argued for upholding the Affordable Care Act's birth control provision in 2015. The rollback of the rule is likely to spur further lawsuits, analysts say. "This provides an exemption, and it's a limited one," said Roger Severino, director of the HHS Office of Civil Rights. "We should have space for organizations to live out their religious identity and not face discrimination." He said he expects that most companies will continue to provide coverage for birth control and that the changes will only affect a tiny percentage of U.S. women. The new rules are being published Friday in the Federal Register and go into effect immediately. But some health policy analysts say the new rule creates a huge opening that lets any employer claim an exemption, leaving their female workers to pay the full cost of any birth control out of pocket. "It is a huge loophole for any employer that does not want to provide birth control coverage to their employees," says Dania Palanker, a professor at Georgetown University's Center on Health Insurance Reform. The change fulfills a promise President Trump made in May to the Catholic religious order The Little Sisters of the Poor in a ceremony in the White House Rose Garden. 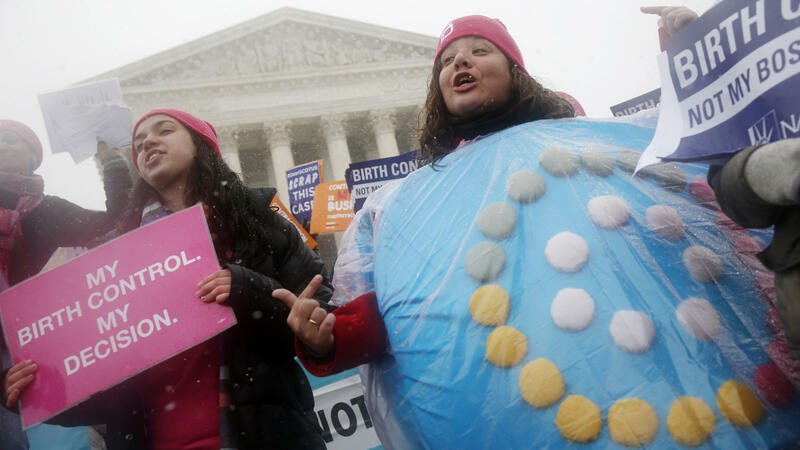 The nuns had sued the Obama administration over the birth control requirement. It also sets up a fight between advocates of religious freedom and those of equal rights for women. The American Civil Liberties Union sued the Trump Administration within hours of the rule being published, claiming it violated the 14th Amendment's Equal Protection Clause, which ensures that all people receive equal protection under the law. "The Trump Administration is forcing women to pay for their boss's religious beliefs," said ACLU senior staff attorney Brigitte Amiri, in a statement. The Affordable Care Act, also known as Obamacare, requires employer-provided health insurance policies to include coverage for preventive health care. After the law passed, HHS used its regulatory authority to specify what has to be included in those preventive services and birth control, including "all Food and Drug Administration approved contraceptive methods, sterilization procedures, and patient education and counseling for all women with reproductive capacity." But the policy was controversial from the start. Several companies and religious groups sued, saying the rule infringed on their religious freedom. The Obama administration created an exemption for churches and allowed other "religious employers" to opt out by notifying the government. When they did so, the administration would arrange with their insurance companies to provide the coverage directly, without the employers' involvement. But the Little Sisters of the Poor weren't happy with that workaround and sued. The group's case, and a second one involving private businesses including the Hobby Lobby chain of craft stores, which has 32,000 employees, went to the Supreme Court. The court ruled in favor of Hobby Lobby in 2014, saying privately held companies could object on religious grounds. And then, last year, the court issued a split ruling in the Little Sisters case, saying the government shouldn't fine the nuns but ordering the two sides to work out an arrangement that accommodates their religious beliefs. Before a deal was reached, Trump became president. At the Rose Garden ceremony in May, he told the Little Sisters of the Poor that he planned to change the rules. "Your long ordeal will soon be over," he promised. Under the new rule, women who work for Hobby Lobby or the religious group may no longer have access to birth control coverage through the Obama-era workaround. A Hobby Lobby spokesman said the company would have no comment on Friday, and the Little Sisters of the Poor didn't respond to NPR's emails seeking comment. Hobby Lobby's founder and CEO David Green told reporters in 2013, "Our family is now being forced to choose between following the laws of the land that we love or maintaining the religious beliefs that have made our business successful and have supported our family and thousands of our employees and their families." HHS officials said they don't expect many companies to seek waivers. They said the group seeking waivers will likely be limited to those about 200 companies and nonprofits that have already sued. But Palanker says the impact could be a lot bigger. There are a lot of large private companies, she says, whose owners may hold strong religious beliefs but did not want the publicity and expense of suing the federal government. "A lot of women will retain birth control coverage," Palanker says, "but there will be a lot of women who will lose that coverage." That means they'll find themselves paying out of pocket. A one-month supply of birth control pills can cost anywhere from $4 to $55 or more, according to GoodRX.com. Longer-acting contraception, like an intrauterine device, can cost more than $1,000, says Sarah Lipton-Lubet, a vice president at the National Partnership for Women and Families. She says the new rule is a tool for discrimination against women. "Women shouldn't be denied access to basic health care based on their employers' religious beliefs," she says. "We all have the right to our religious beliefs. But the way that this rule treats religion is really an excuse to discriminate." HHS officials say they also plan more stringent enforcement of a provision in the Affordable Care Act that prohibits federal subsidies from being used for insurance policies that cover abortion. The agency will issue guidelines for insurers Friday on how they have to charge women who want abortion coverage at least $12 a year more for such a policy, and they have to keep that money in a separate fund to be used only to pay for abortions. In addition to the ACLU, Massachusetts Attorney General Maura Healey, and California Attorney General Javier Becerra announced they too plan to file suit opposing the new rule. The Trump administration is rolling back an Obama-era health care mandate. It had required employers to pay for birth control through their insurance plans. And the Trump administration is leaving that mandate in place, but under its new rule, nearly any employer can opt out of paying for birth control if they have a religious or moral objection. That has already led to lawsuits. NPR's Alison Kodjak has more. ALISON KODJAK, BYLINE: The Affordable Care Act included birth control among the services that company health plans are required to cover. But religious groups objected and sued. Two of those suits, one brought by the company Hobby Lobby and one by the religious order the Little Sisters of the Poor, went to the Supreme Court. The justices ruled that the government can't force private companies or nonprofits to pay for birth control against their religious beliefs. Mark Rienzi represents the Little Sisters. MARK RIENZI: It's downright silly to think that you need nuns to give out contraceptives. You don't. KODJAK: In response to the court ruling, the Obama administration figured out a way for women to still get their birth control covered without the companies having to pay for it. Today's announcement allows religious groups and companies like the Little Sisters and Hobby Lobby to stop their insurers from offering contraception coverage altogether but, more importantly, expands the exemption to any company, even publicly traded ones. So women who work at a lot more companies could end up having to pay full price for contraceptives. Roger Severino leads the Office of Civil Rights at the Department of Health and Human Services. ROGER SEVERINO: In our country, we believe in tolerance. We believe in diversity. We should have space organizations to live out their religious identity and not face discrimination. KODJAK: Depending on who you talk to, today's change may amount to a tiny tweak, or it could lead to women across the country losing access to birth control. Severino from the Health and Human Services Department says the change will affect less than 1 percent of all women. SEVERINO: This provides an exemption. It's a limited one. It provides it only for those with religious or moral convictions that are implicated by the contraceptive mandate. KODJAK: But Dana Singiser over at Planned Parenthood says the new rules are much more sweeping. DANA SINGISER: With this rule in place, any employer for any religious or moral reasons would be allowed to refuse birth control for their employees. KODJAK: Her group says millions of women could lose their insurance coverage for contraceptives. And the truth probably falls somewhere in between. Alison Kodjak, NPR News, Washington. Transcript provided by NPR, Copyright NPR.